The 35-year-old fan favourite, who tied the knot with Katya, 29, back in 2013, has chosen not to address the news of her smooch with comedian Seann, 32. Earlier today, he was tagged in a sweet post from a Strictly Come Dancing fan on Twitter. “My daughter’s reaction every time @MR_NJones comes on TV, safe to say she loves him!” the social media user wrote, uploading a video showing her young daughter looking delighted when Neil came on the screen. “I love Neil!” she squealed in the clip. The fans could be seen watching Neil and Katya dancing a smouldering routine while Gladys Knight performed on the Strictly results show last weekend. It’s not the first time he has appeared to demonstrate ongoing support for his Strictly pro wife since her kiss with Seann. After pictures emerged of the pair smooching in London last week, he broke his social media silence to share a sweet tribute to the duo following their Movie Week Matrix-themed routine. Uploading a clip of the dance in view of his 109,000 Instagram followers, he said: “Wow last night’s @bbcstrictly Movie Week was really epic and I’m proud of @mrs_katjones and @seannwalsh Paso Doble. “Great shapes and of course like always the choreography was on point,” he added. Neil and Katya first met back in 2008 when he filled in for her regular dance partner at a competition in Blackpool. They both joined the line-up of Strictly pros in 2016, although Neil has never been paired with a celebrity partner. Katya had great success in her first year on the show, cementing her place in the Strictly history books with former Shadow Chancellor Ed Balls, 51. Last year, she and her partner Joe McFadden, 42, were crowned champions, lifting the coveted glitter ball trophy. Tonight, she and Seann will take to the Strictly dance floor for the first time since news of their kiss broke. Earlier this week, they appeared on It Takes Two for their first interview following the incident, both having previously apologised on Twitter for their actions. 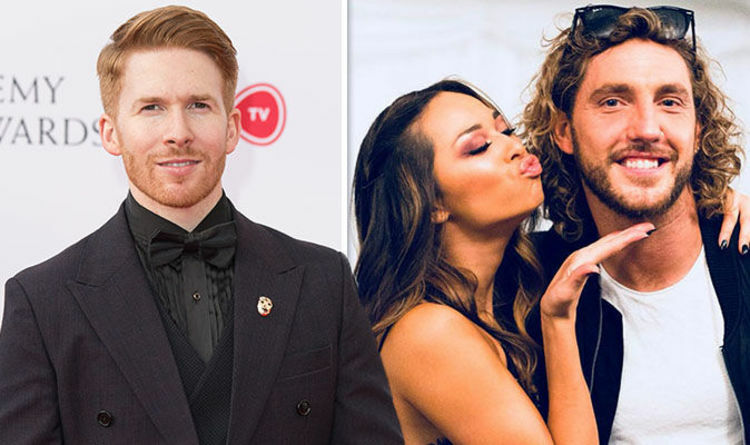 Katya addressed her marriage to Neil, having said in her Twitter statement that the kiss was “not a reflection on their relationship”, saying: ““I apologise to everyone it hurt and it involved, but the main thing for me is me and Neil are fine. “I’m focusing on my job and doing it as professionally as I can,” she added. Seann, meanwhile, appeared to fight back tears as he said: “I’m sorry for the hurt that I’ve caused. We had drinks and we made a huge mistake and I regret it deeply.